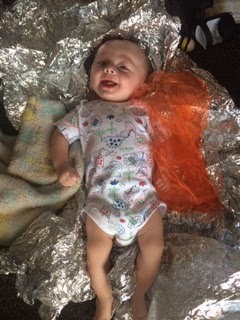 How many of you found that your baby and younger children enjoyed exploring the wrapping paper and boxes instead of the gift? Who noticed relatives i.e. granny/auntie looking upset, because baby wasn’t interested in the huge, brightly coloured, expensive toy that they brought? I remember this when my 3 were little (a long time ago) The boys were 6 and 7 months when they experienced their first Christmas. Our daughter was 11 months. The boys were only interested in the wrapping paper. The cries of delight came from the adults, including me I might add! At 11 months, our daughter was slightly more interested in the contents, she thoroughly enjoyed tearing the paper off more. I also remember thinking, this is going to take them days to get through all of these gifts, and where will I put them! The fact is that the feel, sound, sight and even taste of the wrapping can be much more exciting to explore. 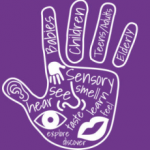 All children are sensory alert. They are born to learn, survive and find out about the world through their sense. When baby is born the most important smell, sound, taste, touch to them is that of the main carer/parent. This is how we learn. As children and adults, the best experiences and the most remembered include sensory elements. Think about an experience from your childhood and link it to; what did you see, smell, touch, taste. I’d love to hear about it. When I worked in the nursery, we visited the farm every year. For some children it was a first experience. We made this visit memorable and educational. We prepared and planned for the weeks leading up to the visit. We sang songs and rhymes each day, including ‘Old Mc Donald’, using actions, pictures and sounds. We set up small world play using the model farm and animals. We read stories about animals and the farm. We put up pictures of animals around the room, inspiring the children to draw and paint. The children made their own model farm, using boxes, bottle tops, materials, scissors, glue and sellotape. We counted animals, their legs, wings (Maths Language) We talked about colours, sounds, touch, taste. We even borrowed some duck eggs in an incubator from the local farm and watched them hatch. Imagine the excitement! When we eventually went to the farm, the children remembered the names of the animals, how many legs, colour, feel. Oh and smell! This went on for weeks after. The learning gained through using their different senses was amazing and hopefully it has stayed with then. The best learning takes place using multi sensory opportunities and following the children’s lead. Children enjoy real life experiences and items. If they enjoy the sound, feel, sight of the wrapping paper, then go with it. If they enjoy making marks in their yogurt on their high chair, let them. Its easy cleaned afterwards. What better way is there to learn writing skills. If they enjoy making sounds with pans, spoons, chain, keys, then why not. What a great way to encourage listening skills. It is so easy to add items to a box or basket and let them explore using their senses. As they develop and get older, their interests will change. Its great to add items that they choose, such as, animals, dinosaurs, cars, trains, books, puzzles. The good thing about a Treasure Basket is how it can grow and develop with your child. A wooden train feels different to a metal train or a soft train, or a book about trains, a train track. Going to see real trains can the experience more memorable and exciting. Early sensory experiences build a foundation for future learning. www.sensorytreasures.co.uk Adding to and reinforcing, makes the learning experience stronger. Jack at the age of 3 year enjoyed all things train related. If you haven’t thought about a Treasure Box or Basket, then start now. Check out https://sensorytreasures.co.uk/uncategorized/what-are-treasure-baskets/ for more ideas.